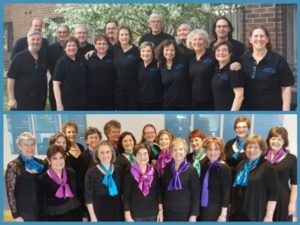 Kol Nashim, the women’s choir of the Colorado Hebrew Chorale, is a non-auditioned choir, under the direction of founder Leah Peer. The Colorado Hebrew Chorale rehearses Monday nights 7:30 – 9:30 p.m.
Kol Nashim rehearses Thursday nights 6:00 – 8:15 p.m.
Our members are: Orthodox, Conservative, Reform, Reconstructionist, Unaffiliated, and non-Jewish. Our members are people who: work full time, are retirees, students and teachers. Our members are: single, married, divorced, straight and LGBTQ. Our members range in age from 14 to 80 – and counting! If you love to sing (and can carry a tune) and want to learn many different types of Jewish music, please come check us out!